As part of our commitment to be one of the most modern dental practices in Orange, we are pleased to offer two flat screen TVs in each treatment room. We have wall mounted 32 inch flat screen TVs to watch while you are first seated. But it doesn’t end there. When we tilt you back to get to work, there is a ceiling mounted TV directly above the chair! Each one comes with Optimum cable with over 200 channels from which to choose. You have your own remote control to select exactly what channel you want to watch on your dedicated flat screen TV. The photo shows one of our wall mounted TVs. We designed our rooms this way because we are a family practice serving all ages including the pediatric population. This allows you to bring your entire family in for a visit and keep your kids entertained throughout. 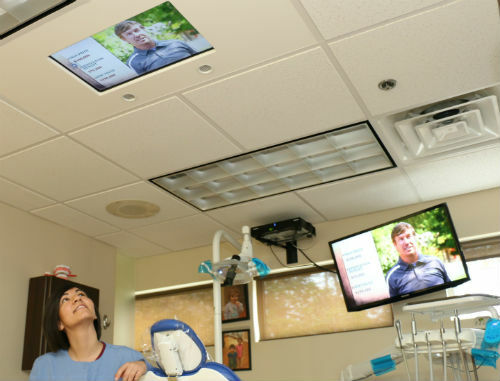 One of our staff members looks up at our ceiling mounted TV directly above the dental chair. Now you can watch TV while getting your teeth cleaned or having a filling done! Since each TV has its own dedicated cable box, you can watch HGTV in your chair while your kids are watching Disney in the next room. Or alternatively, you can have your child get his/her cleaning while a sibling stays next to him/her watching Nickelodeon! That sibling stays entertained the entire time. All of the wall mounted TVs can be moved and tilted to accommodate a viewer in any part of the room. The ceiling mounted TVs are fixed in place above the chair. We’ve found that for young kids, the TV directly above the dental chair can often make a worrisome and difficult procedure go very smoothly. And in many of those cases, we initially thought nitrous oxide might be needed, but the TV did the trick! Want to watch HGTV while receiving a filling? Check! Need to check out scores on ESPN while having a crown cemented? We got it covered! We know that coming to the dentist is not always the most enjoyable. This is just another thing we do to make your visit as pleasant as possible!